Digital SLR Cameras are taking over the photomicrography market, quickly replacing dedicated CCD imagers. The reasons are many.. Modern DSLR cameras offer such features as “live view” on a computer screen, full HD quality video and high resolution digital stills. DSLRs are useful for other tasks and their pricing is very competitive. DSLRs are also self contained and can fully function without being tethered to a computer when necessary. The reasoning is solid and implementation is now easy.The VariMag II system will quickly and easily mate your DSLR camera to your microscope. VariMag II provides a solid mechanical connection combined with a quality variable magnification optical system. The research grade VariMag II system was designed to be affordable, easy to setup, easy to use, and to provide professional results. VariMag II will fit most microscopes. Three Modular mounts are included to fit 23mm, 30mm and 30.5mm ocular ports as well as any common 1x “C-Mount” or “C/S-Mount”. As its name implies VariMag stands for “Variable Magnification”. VariMag II offers the largest magnification range in the industry by using dual range modular photographic eyepieces. We include two photo eyepieces (1 Low Range and 1 High Range) in every kit as standard equipment. The photo eyepieces are mounted in easy to change proprietary “optics cartridges” for convenience. Try to find another adapter that includes 2 photo eyepieces at any price, let alone at this modest price point. In addition VariMag II uses an infinitely adjustable variable projection unit, so there are no gaps throughout the entire magnification range. For further versatility (and future adaptability) we designed the VariMag II system with an interchangeable camera mounting ring so you can use VariMag II on DSLRs of any brand, just order a new inexpensive ($25) ring for the new camera. 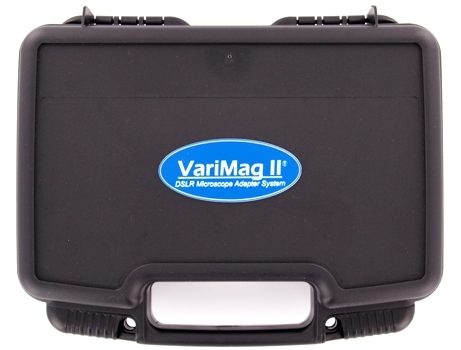 No need to buy a whole new adapter just because you bought a new camera, and you will also have the ability to share it among other DSLR cameras.Whether you image for biology, pathology, materials analysis or forensics you will find the VariMag system is easy to use and provides professional results. We offer a 30 day No Risk 100% money back guarantee and a 5 year free replacement warranty on all parts. The VariMag II system includes not only one, but two Photo Eyepieces. One Low Range (1.5x-2.5x) , and one High Range (2.5x-3.5x). 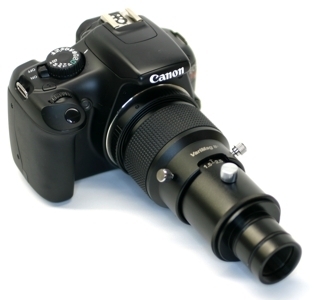 Many adapters require you to purchase a photo eyepiece separately with costs frequently over $500 each. We have been manufacturing specialized photographic eyepieces for over 15 years, our production experience and makes it possible to include two quality photo eyepieces at this modest price point. 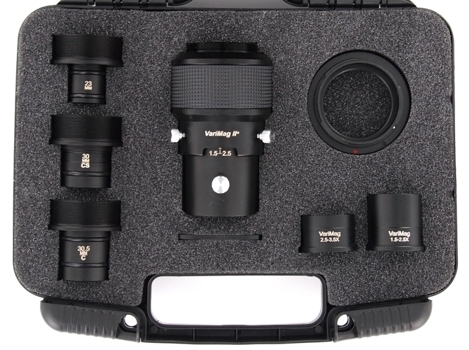 The specialized photo eyepieces included with the VariMag system are mounted in easily interchangeable “optic cartridges”. As its name implies “VariMag” is a variable magnification adapter. A variable magnification adapter offers significant advantages over a fixed magnification adapter. For example you can use variable magnification to calibrate your camera to a known scale, making measurements easier. With the ability to adjust the scale of the image you can better frame your shots. Why limit yourself to a single magnification? If your needs are critical beware of low priced hobby grade adapters. You get what you pay for in optics. Low cost adapters typically have vignetting, color fringing and spherical aberration. If it were just a mechanical adapter it would be one thing, but optics require exceptional precision with accuracies measured in wavelengths of light. Anything lessdestroys the fidelity of the entire system. If you want to measure you need optics that produce a flat and linear image. This is the downfall of many DSLR camera adapters, even units costing several times as much. You may see lots of pretty images on their websites, but you should be asking for only one.. a simple image of close, evenly spaced horizontal and vertical lines at high power. This simple image is like truth serum for optics and it will show plenty about the optics being used. The most common optical defect being “spherical aberration” which will show itself as a ballooning or pincushion effect (Hubble had spherical aberration). The non-linearity of an image with pincushion effect will make accurate measuring impossible. Due to the interchangeable camera mounting rings and flexible mounting solutions your VariMag II system will be usable for many years to come, even if you switch camera brandsand microscopes. We also offer an upgrade path to our previous customers so you can enjoy all of the latest features at a very nominal cost over the original purchase price.